NOTE: comments are now closed on this post- thank you!! I don't usually play along with blog hops, but my dear friend and one of our Regional Instructors, Sharon, invited me to join them for the Just Rite blog hop this week, so I figured I'd play along. 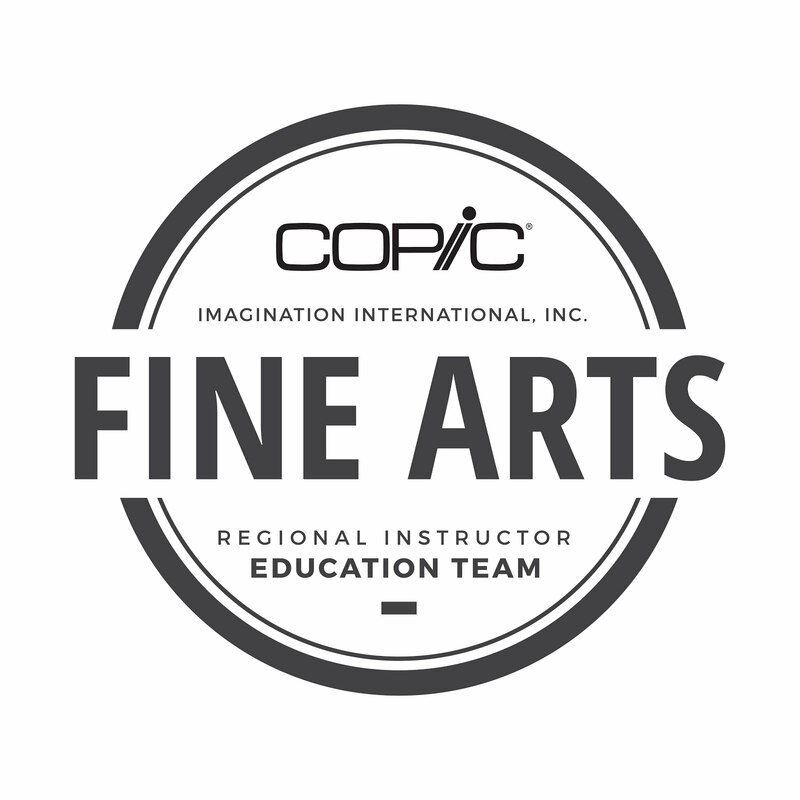 I am busy getting ready for the Portland Certification class this week, so if you'll be joining me, I am really looking forward to coloring with you! Leave a comment today for your chance to win (see below). Everything on the tag today started out white. 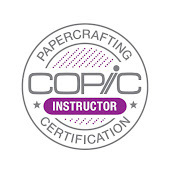 The tag, the paper, the ribbons- they all began life white, and with a little help from Copic they changed. The image is so tiny that it is very easy to blend, and coloring took only a couple minutes. I started with BV00 for the centers of each flower, then blended in RV00 to create the base tone for the image. To blend, I simply colored in circles over each petal until the BV00 softened out into the pale pink. For contrast, I added E04, then softened it in with a bit more BV00 and RV00. My leaves were a simple base of YG11, then I added G85, since it is a nice earthy green that is not too vibrant. I went back with the YG11 to blend in the G85. On the final image I darkened any areas that blended out too much by adding a touch more of the G85. This helps keep strong cotrast in my image, and contrast is what makes things look interesting. Then I scribbled some W3, Y11 and W1 around the image for a soft background (not pictured in this diagram) and blended it out with my colorless belnder, again by scribbling. Carefully, I tore out my flower image, then antiqued it using a Memento, Sand stamp pad. Next, I took my favorite white ribbon and colored it with G85, E04, and BV00 to add to the tag. Now look at the closeup of the final tag. I colored the background of the tag as if it were wood (see this old post for complete directions) however, I used colors that I had already used in coloring my main image. I streaked in W1, W3, and added darker streaks with E04. I added streaks of Y11, and faded everything with more W1. I added some faint streaks of RV00 to tie in that color as well, then carefully with the tip of my marker I added a few tiny dots of each color. Click on the image to get a close-up on the faux-wood background. I also added more of the Sand stamp pad to the background to break up the pattern as well. Now, take this chance and go check out the other fabulous blogs on the hop for more inspiration, and more chances to win! Sounds like fun! I LOVE your tag...thank you for the details! What an incredible tag and excellent directions. Thanks for participating with such a great entry. Very pretty tag--I would use it as a bookmark! So pretty Marianne! Love the colors you have put together on this one! So delicate. Wonderful and thanks for sharing!! Just lovely! I love how you color- absolutely beautiful! What a gorgeous tag Marianne. Thinking Spring with this project...love the colors! I love your project. Great happy colors and details!! 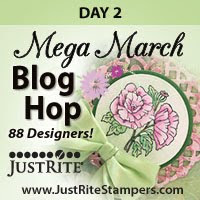 Ohhh...Thank you so much for showing us how to color these gorgeous stamps...love your tag! Great project! Wonderful teaching skills..you rock on! I love your project Marianne, and of course the wonderful instructions! Thank you! 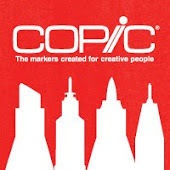 A great tag and wonderful COPIC coloring info - thank you! I need all the help I can get - LOL! Your tag is beautiful. I love your coloring and all of those ribbons! Thanks for sharing. This is a very pretty tag. I love all the details that you put into it. That is beautiful and thanks so much for the detailed instructions for those of us that are detailed recipe followers! Very pretty tag. Love your little tutorial! This is beautiful. Love the tag. I love tags. Thanks for sharing the directions. awesome taggie - thanks for the awesome little tutorial :) I also love those ribbon stands - super festive! I love the tag! You really know how to work those copics! Thanks for the tutorial Marianne! Love the tag. nice tags. I really like and appreciate your step by step coloring instructions. Beautiful tag! The colors are just beautiful. Amazing tag! I love it! Gorgeous.....tags are a favorite of mine!! So pretty. Love your tag. The ribbons are a darling touch! I love how you used them. TFS! So pretty, and I really like the colors you used. Love the tag and thanks for the little color tutorial! Great tag. Love the colors. Thanks for your great details. I love my copic. Just been using for avery short trime but loving them. You girls make it look so easy. Beautiful, fun, simple and of course gorgeous. Thank you for a lovely tag and details. love love love the cute tag. Markers are so under rated. You do a beautiful job. What a cute tag. This would be so cute on a gift bag. Thanks for sharing your technique with us. Love the colors! See you soon in Phoenix!!! Marianne...thanks for showing us your wonderful tag and giving the details for coloring it. Your tag is beautiful. Love the colors. Great for a bookmaker! Very pretty tag. I love your coloring tutorials. Lovely flowers and I like the multiple ribbons at the top. This is just incredible! Wonderful step-by-step details as well! WOW! I know I'll never be remotely as good at coloring with my Copics, but I love to come here to see your gorgeous creations & details of how to achieve them! Great detailed instructions and beautiful tag. Beautiful tag, love the colors. Gorgeous tag!! LOVE the coloring of the flowers! Love bookmarks and hydrangeas...just perfect! I love that tag! Its beautiful! Great job in blending colors. Perfectly colored stamp image - of course!!!! Great tag. I learn so much from your blog. Love your tag and as always your colouring is to die for. Thanks for sharing, I love to follow your tutorials. Now that's the way to use techniques! Love the tag and the fact that everything you used started out white! Who would think it to see the finished work! Just knew your project would be spectacular. I love that tag Marianne and your tutorial. Gorgeous tag!!! I love how you colored the flowers - thanks for the tutorial on this!!! You are always so amazing! I love your tutorials and little tips. They've helped me so much this past year. Thank you! I love it! I never would have thought to color the ribbons. What a neat idea. I'll have to try it. Lovely tag, have a great time with your class! Fabulous tag! I just love looking at your blog...it's fabulous to see the colors you use with the images for us copic challenged people...lol!!! Beautiful tag and love the flowers on there. Thanks for sharing and the directions too. The tag is gorgeous...the coloring instruction was very helpful. Thanks for sharing. Really pretty, thanks for sharing all the details. Very pretty tag. Love your blog! What a lovely card....your tutorial is great - as a new owner of Copics, I need all the help I can get!! Just beautiful, I love tags. What a wonderful job on your project. Liking new ideas!!! Beautiful tag. Thanks so much for the awesome tutorial. Loved it. I totally love making bookmarks. Your tag makes me think of that. Thanks for showing it. Love the copic coloring. Such beautiful colors. The ribbons really pop this tag - great job! I need to try some copics. The colors look so vibrant with these markers. Great idea for the tag. Great tag, thanks for sharing! Lovely tag! I love all the ribbons and the coloring is just beautiful! Your tag is very prety indeed. GORGEOUS - quite lovely. love it. What a great Tag! Thanks for the opportunity to win some candy! beautiful - would make a lovely bookmark! Love the tag, and thanks for the details! Your coloring is always so gorgeous! Thank you for the directions. I'm very new to coloring techniques and I love to see how different looks are achieved. beautiful tags! i love them! oh, what a great tag. Thanks for the tutorial. Lovin' my copics. Love the tag and I love coloring with my copics. Oh what a beautiful tag. Thank you for the directions on how you did your coloring! I love your tutorials. Such great ideas. Your tag is so lovley! Ooooh! You are just way to talanted!!! You've got a great eye! The hydrangea is gorgeous! What a pretty tag. Thanks for the inspiration! Great bookmark! And thanks for all your wonderful coloring tips! What a very pretty tag! TFS! Thanks for showing the colors that you used on the tag! I love the coloring and the ribbon treatment you did on this fun little tag. So cute! Great tag. I love it. So beautifully done! LOVE your tag!!! Great tag! Love the delicate look of it. This is a wonderful tag, and I like the wood effect! Thanks! Such a beautiful tag!! I love how you show how you do your coloring with your copics!! Thank you. Beautiful tag and lovely colours. Thank you for sharing. Love the tag project & colors you used on the geranium. So very nice. What a privilege to have you participating in this Blog! Thank you so much for sharing your talent with us! Your tag is wonderful and your technique is excellent! It is my dream to some day be able to take a class from you! Pretty, pretty tag! the ribbon really adds something special. Love the tag! The flower is soo delicate. Thank you so much for the detailed coloring instructions. The finished project is so pretty. Very sweet tag. Love the coloring. Thanks for the coloring details. I love how you used the markers to create the wood background for your tag. Very cool, thanks for the opportunity to win. The ribbons you chose are perfect for the colors on the tag. Great use of these amazing flowers. Really pretty. Excellent tag with the ribbon under the image and used again up top -- thanks for the idea! Your tag would make a fabulous bookmark! Love the faux wood - a perfect background for your pretty tag! Beautiful tag - as usual breathtaking coloring! Love the pretty tag and ribbon! Your tag is very pretty and inspiring. What a wonderful tag! Great inspiration - thank you! This would be a fun bookmark! Great tag--I really like the wood look. 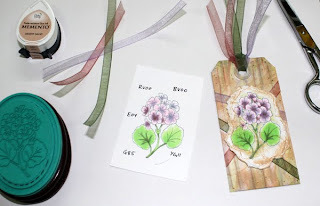 I love the look of a wood grain you made on your gorgeous tag, and your coloring is beautiful! I am in love with book marks. I love the colors of the markers you used. 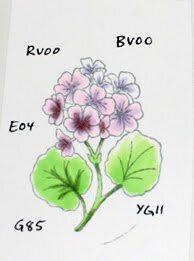 Thanks for the detailed steps in coloring the geranium. Very pretty! Love the gorgeous flower! Love the tag! So many wonderful ideas you all have.